A coalition of Iranian pro-democracy organizations has reported that the father of Atena Farghadani was one of the people beaten by police at a vigil outside of Tehran’s Evin Prison earlier this week. 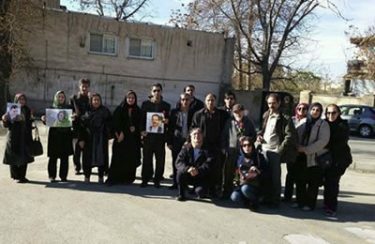 The National Council of Resistance to Iran (NCRI) reports that the group that had gathered outside the prison was comprised of family members of prisoners and included Dr. Mohammad Maleki, former chancellor of Tehran University. NCRI’s website says Iranian security forces “attacked and beat up the families to force them to disperse.” Atena Farghadani’s father’s condition and that of the other protesters is not known. Atena Farghadani received a 12 year, nine month prison sentence in June, 2015 — pronounced guilty of unpatriotic activity and insulting parliamentarians after posting a cartoon in defence of women’s reproductive rights on her Facebook page. CRNI presented its Courage in Editorial Cartooning award in absentia to Ms. Farghadani in 2015.